"Roll out the red carpet! 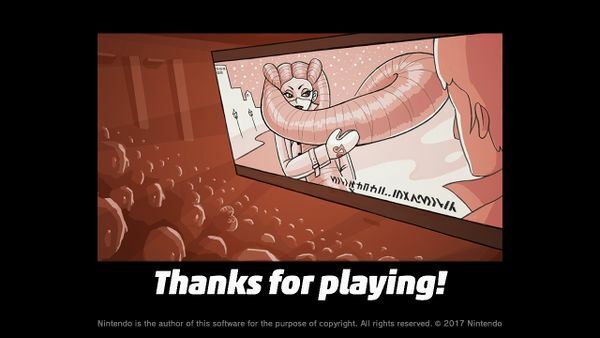 'The silver screen queen' herself, Twintelle is making her entrance. She's an ARMS fighter, but it's not her arms you need to worry about... It's her hair that packs a punch! So keep your eyes on those shiny, silvery locks!" Twintelle is a playable fighter in ARMS. She was first revealed during the ARMS Direct on 2017-05-17. Twintelle is a human with dark brown skin. She has aquamarine eyes with magenta eyelashes and white hair with pink highlights in two tails. This hair is the one that manifests its capacity for ARMS, unlike the arms of most wrestlers, and as such, she also has natural human arms. She use a blue mask with turquoise markings around the eyes that look like a mask or eye shadow, and a small turquoise dot on the right that acts as a beauty mark. Her outfit consists of a sleeveless white shirt with a high collar, a diamond-like pattern, a magenta waist, a golden zip on the back and a logo embellished in gold on the chest. She wears black pants with magenta pink lines on the sides, and black heels with white straps and red soles. Her accessories include earrings in the form of leaves and gold bracelets. Another outfit she wears includes a high-collared coat with black buttons and mittens with her logo on them, and a sleeveless white shirt with a transparent high collar and tight blue jeans along with black heels. "The mega celeb, star of the silver screen tries her hand...er, hair at the ARMS Grand Prix. Not content with her acting awards and accolades, she's gonna use those stretchy silver locks to take the ARMS title! Oh, and while she's charging up, her actress aura can slow down incoming ARMS!" Twintelle used to be labelmates with Ribbon Girl, as Biff put it, before she moved on to a career of acting. According to ARMS Labs, she is the only person whose hair possesses the ARMS ability. She has refused requests for examination from the ARMS Labs three times. The labs are currently trying to get at least a single hair from her for examination. Twintelle overall is designed as a well-rounded fighter. Her abilities include slowing incoming attacks while dashing and charging her punches in mid-air by holding the dash button. While charging, she can quickly move when she attacks to dodge any punches that are slowed down. Twintelle. The fans are going wild! 60 Play as Twintelle 50 times. all your own stunts? 200 Play as Twintelle 500 times. rounds against Twintelle! 100 Defeat Twintelle 100 times. special aura around you! 200 Defeat Twintelle 250 times. Twintelle really paid off. 30 Choose Twintelle in the third Party Crash event and reach level 5 (no longer obtainable), or get it randomly from the random badges (levels 15-30) obtainable in future Party Crashes. in the 3rd Party Crash? Twintelle would be so proud. 30 Choose Twintelle in the third Party Crash event and reach level 10 (no longer obtainable), or get it randomly from the random badges (levels 15-30) obtainable in future Party Crashes. Nice work, Twintelle! 30 Choose Twintelle in the eleventh Party Crash event and reach level 5 (no longer obtainable), or get it randomly from the random badges (levels 15-30) obtainable in future Party Crashes. Way to be, Twintelle! 30 Choose Twintelle in the eleventh Party Crash event and reach level 10 (no longer obtainable), or get it randomly from the random badges (levels 15-30) obtainable in future Party Crashes. Twintelle vs. Lola Pop! 60 Participate in 1-on-1 matches between Twintelle and Lola Pop adding up to a total of ten or more rounds. the Slapamander. Clap clapamander! 30 Defeat an opponent using Twintelle equipped with the Slapamander on at least one ARM. It is likely that Twintelle's name comes from "twin tails", referencing her unique hair, with "-telle", a suffix in French names, added to the end. Twintelle speaks in French, and English with a French accent. 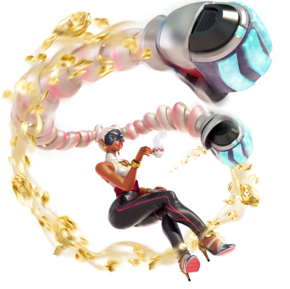 Twintelle is the only character whose default ARMS are of the same weight class, with the Chilla, Parasol, and Thunderbird all being medium weight. She is the only fighter to have both the natural ARMS ability and regular human arms. Helix has a crush on her since his childhood. ↑ NintenU, YouTube, at 5:01. "ARMS - Grand Prix - Twintelle Level 4"